Budapest: World championship leader Nico Rosberg once again took full advantage of Mercedes teammate Lewis Hamilton’s bad luck on Saturday by claiming pole position for the Hungarian Grand Prix. The 29-year-old German, who leads Hamilton by 14 points in their duel for the drivers’ title, cashed in after the luckless Briton’s car burst into flames in the opening minutes of a dramatic qualifying session. 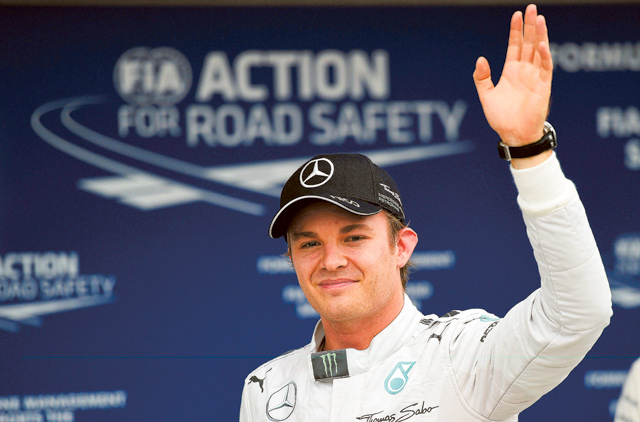 Rosberg clocked a best lap of one minute and 22.715 seconds to claim his sixth pole of the year and the 10th of his career in an hour that saw intense heat, at the start, followed by dark clouds and rain in the final minutes. Rosberg was first car out in Q3 and ran wide at Turn One shortly before Danish rookie Kevin Magnussen flew off and into the barriers at the same place. That caused red flags and the session was halted for five minutes, resuming in damp, but drying conditions as the hot sunshine resumed — a scenario that saw a series of drivers in serious contention for pole. Sebastian Vettel clocked a best lap of 1:23.201 that put him clear at the top in the final seconds, but Rosberg responded to outpace him by 0.486 seconds to secure the prime starting position. Finn Valtteri Bottas was third for Williams ahead of Australian Daniel Ricciardo in the second Red Bull, two-time champion Spaniard Fernando Alonso of Ferrari and Brazilian Felipe Massa, sixth for Williams. Briton Jenson Button, twice a winner in Hungary, in wet conditions, was seventh for McLaren ahead of Frenchman Jean-Eric Vergne of Toro Rosso, German Nico Hulkenberg of Force India and Magnussen. “We’ll have to replace the engine and gearbox, but with that penalty it’s a good thing [for a gearbox change],” said Hamilton. “I can’t go any further back. Earlier on a day of less-stifling heat than Friday, with a track temperature of a relatively modest 46 degrees Celsius, Hamilton was the second man eliminated in Q1, his car blazing from a first lap fuel leak just after Venezuelan Pastor Maldonado had idled to a halt in his Lotus. Both men failed to set a time and are expected to start from the back of the grid. Out with them went the two Caterham drivers, Swedish rookie Marcus Eriksson and Japanese Kamui Kobayashi, along with Briton Max Chilton of Marussia and, in a major shock, Kimi Raikkonen of Ferrari, the Italian team miscalculating their strategy and sending the Finn out on mediums instead of soft tyres. Much to Ferrari’s and Raikkonen’s embarrassment, their mistake allowed much-admired Frenchman Jules Bianchi, strongly tipped for a move to the ‘scarlet scuderia’, to take 16th place on the grid in the second Marussia. The opening session was led by another Frenchman, Jean-Eric Vergne of Toro Rosso, who continued to impress in Q2 when he survived for the top ten shootout, while a late spin by his teammate, Russian rookie Daniil Kvyat, saw him eliminated in 11th place.